Story #12: Can Chinese “Rule of Law” Attract Financial Liquidity? Before closing, we also cover UnAnswered Questions, Inspiration, & Go Local. Make sure to check out our 2nd Quarter 2018 Wrap Up web presentation. The News Trends & Stories section includes our complete trends list, our choices for top news videos of the quarter, our updated report card for the Trump administration, and our listing of the headlines during the 2nd Quarter that inspired our picks for the top 20 stories. This link to the web presentation is posted in your subscriber links above. If you have not listened to Part I, make sure you do so, particularly story #1: The AI Invasion. As our discussion is lengthy, we will publish both full-length and chapter-length versions so you can listen selectively if you prefer. We will publish our 2nd Quarter Equity Overview on July 12, covering equity markets and the Blockbuster Chartology from Rambus for the 2nd Quarter 2018. 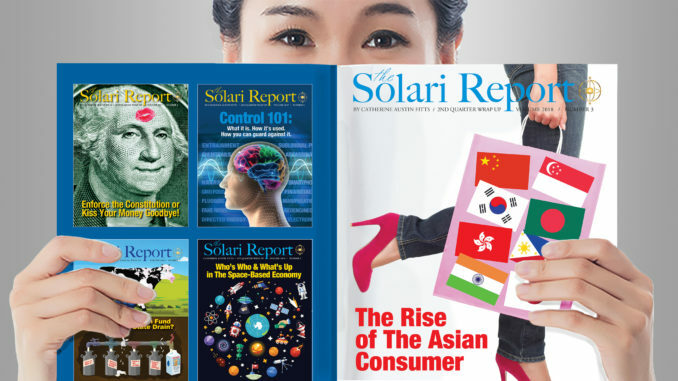 Our theme: The Rise of the Asian Consumer will appear in the last week of July. The growth of the Asian middle class is a major investment and cultural trend that is impacting us now and will continue to do so for decades to come. There will be no Money & Markets this week as this is the last week of the month. I am headed for Europe this coming week, eager to report on events from “on the ground.” I will be in Vienna, Sofia, Bucharest and Freisland through the end of July, then on to Zurich, Lake Constance (Bregenz, here I come!) and a journey through France during August. In Let’s Go to the Movies, I recommend one of my favorite Australian documentaries, Red Obsession, which was Solari Documentary of the Year in 2014. Narrated by Russell Crowe, there is no better film to help you appreciate the rising impact of the Asian consumer on markets and culture around the world.